When exploring digital diplomacy I am always surprised to learn that social media has augmented the practice of diplomacy, rather than revolutionize it. Indeed, many of the characteristics of digital diplomacy have been part of the diplomatic DNA for centuries. As Oxford University’s Corneliu Bjola writes, the formation and maintenance of relationships with foreign governments and populations was a core practice for ambassadors serving at foreign courts. Networks are also not a novel phenomenon in diplomacy. The Catholic Church has long since operated as a global network in which information was passed through an interconnected web of papal legates and cardinals. Dutch merchants and traders also managed a global network of commerce. Jewish Communities- Israel has always sought to maintain close ties with Jewish communities around the world. These communities were seen as a strategic asset that may facilitate the creation of relationships with foreign nations. Jewish communities were asked to lobby foreign governments in order to secure international recognition of Israel’s independence. Likewise, Jewish communities were used in order to establish diplomatic relations between Israel and foreign nations. Thus, Israeli diplomats and embassies have historically been tasked with maintaining the cultural bonds between Israel and Jewish communities around the world. This included celebrating Jewish holidays, working alongside Jewish institutions and promoting Jewish culture. In the age of Social Networking Sites (SNS), these bonds have grown even closer. Israeli embassies create social media content that targets Jewish communities and Jewish youths. The Israeli MFA uses SNS to promote Jewish culture throughout the while Israeli officials use social media in order to communicate directly with Jewish communities thus overcoming spatial limitations. Israeli Prime Ministers address annual gatherings of Jewish community leaders through twitter, Facebook and Vimeo. Such is the case in the video below in which Israel’s Prime Minister addresses a gathering of Jewish Federations in the USA. Expats- While Israel has always networked with Jewish communities the same cannot be said for Israeli expats. During Israel’s formative years, Israeli expats were viewed as traitors to the cause of Israeli independence. In the 1970’s, former Israel Prime Ministers referred to such expats as “A windfall of weaklings”. Diaspora’s role in diplomacy has risen to prominence in recent years given the growth of migrant communities. Nations such as India, Mexico and China all attempt to nurture relations with expats as these may increase trade between nations, foster intimate relationships between governments and provide intelligence. This is also true of Israel who since the 1980’s and 90’s has altered its perception of expats. As it is now estimated that more than a million Israelis live abroad, Israeli embassies and diplomats are charged with maintaining ties and utilizing expats to achieve Israel’s national goals. In the age of twitter and Facebook, maintaining ties with diasporas has become more financially feasible. From recent interviews with digital diplomacy practitioners at Israeli embassies, I have learned that these view expats as an important target audience and author online content to meets expats’ needs. This includes news from Israel and the region, coverage of important political and social events in Israel, providing consular information and assistance, news on investment opportunities in Israel and even ways in which Israeli expats can become involved in embassy and public diplomacy activities. SNS is thus used to cement relations with diasporas and mobilize them. To all our friends around the world, have a peaceful weekend. #ShabbatShalom from Jerusalem. NGOs and connected individuals- NGOs are regarded as important actors in networked diplomacy as the rise of networks has seen erosion in the power of the nation state. Interestingly, Israel maintains close ties with NGOs that have chosen to dedicate time and resources to promoting Israeli causes online. This includes providing such NGOs with public diplomacy and nation branding materials, coordinating social media campaigns and collaborating on joint projects. Such a collaboration was recently announced by the Israeli Prime Minister’s Office and the NGO “StandWithUS” which organizes Israeli advocacy campaigns around the world. This new joint venture aims to train Israeli, American and British university students in the use of social media to educate the world about Israel. Essentially, students will learn how to disseminate Israeli public diplomacy materials among their own social networks. Such an activity represents a form of peer-to-peer diplomacy (P2P) which is seen as especially beneficial as people may be more receptive to messages authored by their online “friends” than those authored by governmental institutions which may be viewed as “Twipoganda”. This is not the first time Israel has employed the power of peer-to-peer diplomacy. 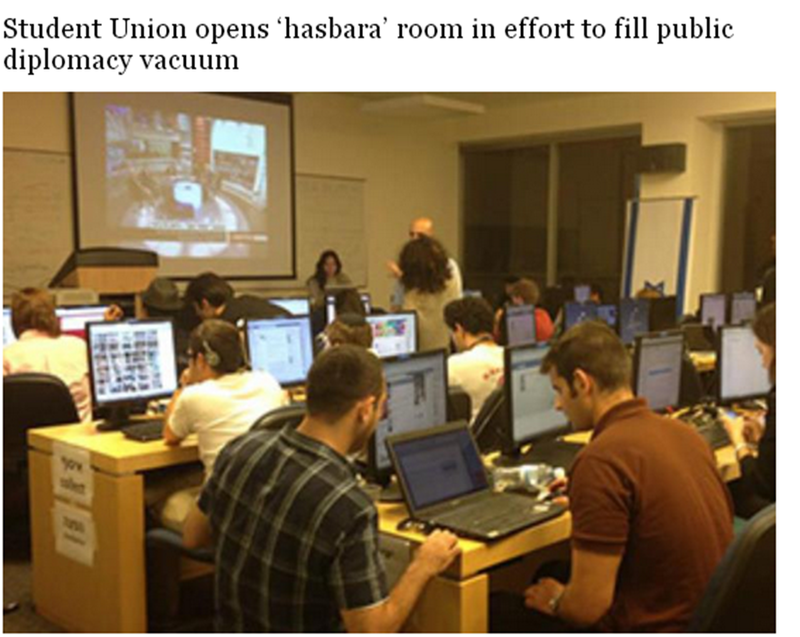 During the 2014 war in Gaza, Israeli university students set up a “War Room” in which they disseminated MFA social media content throughout their own social networks. Between networking and interfering- As Jan Melissen and Brian Hocking recently wrote, there is a thin line between public diplomacy, networking and interfering. While Israel has been active in strengthening its ties with Jewish communities, it has often mobilized them in an attempt to meddle with internal politics of other nations. This is nowhere more evident than in recent Israeli attempts to derail the nuclear agreement in the US Congress. Israeli officials have south to pressure US politicians into rejecting the deal through powerful Jewish organizations. In his recent address to Jewish community leaders, Prime Minister Netanyahu openly called on Jewish leaders to lead the charge against the agreement with Iran. Such activities are detrimental in two ways. As Phillip Seib recently wrote, they constitute a blunt interference in foreign nations’ internal affairs and may prove counterproductive as they strain relations between nations. In Israel’s case, its relationship with the US is viewed as crucial to Israel’s strategic goals. Yet even more importantly, these activities pit American Jewish communities against their own country forcing them to choose between their allegiance to the US and their support of Israel. Indeed, Jewish American communities now find themselves struggling to redefine their relationship with Israel and even distance themselves from Israel. Thus, crossing the line between networking and interfering challenges both relations between nations and between nations and their ethnic diasporas. The ethics of P2P diplomacy- Peer-to-peer diplomacy may prove a valuable tool for nations, especially when citizens chose to disseminate public diplomacy materials on their own accord. Yet training students in peer-to-peer diplomacy crosses the threshold between P2P and Twipoganda. Such students essentially become agents of the state and use their guise as regular SNS users in order to spread public diplomacy materials to unsuspecting “friends”. Nations employing such P2P programs may be seen as employing disingenuous tactics of influence. Thus, this may be viewed as an especially unethical form of networked diplomacy. An incoherent narrator- Finally, Israel has always segmented its public diplomacy activities. This was nowhere more evident than in the previous Netanyahu government as Israel’s Communications Minister was in charge of Israeli-U.S. relations, Israel’s Justice Minister was in charge of negotiations with the Palestinians and Israel’s Economy Minister was in charge of relations with the global Jewish Diaspora. By collaborating with numerous NGOs on public diplomacy activities, Israel may be adding a multitude of stakeholders to an already overcrowded network. This, in turn, may inhibit the Israeli MFA’s ability to author, and narrate, a consistent Israeli foreign policy and national image. Posted in Uncategorized and tagged diaspora diplomacy, Digital Diplomacy, diplomacy, expats, Facebook, Israel, networked diplomacy, Twitter. Bookmark the permalink.